After the heavy legislation of yesterday a slightly different pace today. First up was standing order business. There was a large debate on whether the Crown Nominations Commission (the body that chooses dioscean bishops) should continue to vote in a secret ballot. House of Laity For 63, Against 99, Abst 5. This was followed by farewells to the Bishops of Dover and Norwich. Day two of general synod is a heavy day off legislative business. After an enjoyable lie in (by my normal weekday standards) and leisurely breakfast my wife announced she would join me in the journey to Church House as she wished to visit Church House Bookshop. Anyone who knows Jane will be getting worried at this point as they know she loves to buy new theology books. Well any new books actually. Well any books at all new or not! First problem of the day was actually getting there as the district line wasn't running for too signal failure, so had to take a round about route. Draft Church Representation and Ministers Measure (GS 2046BB) - this generated quite a lot of debate. 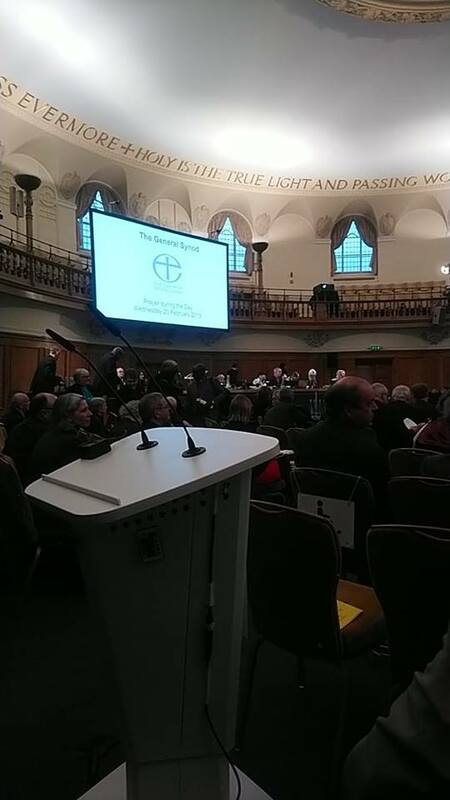 While the document was generally welcomed (especially on electronic voting) there was large concern raised about limiting Deanry Synod to two terms. Concerns were raised about losing existing experienced members. Additionally questions were raised about why term limits were not applying to General or Dioscean Synod members. The outcome from this was that the section on term limits will be reviewed by the business committee's election review panel. There was some discussion whether the Private Member's Motion: Homeless Task Force (GS 2110A) & (GS 2110B) should be put off due to timed business. However the Synod moved a variation of business to allow this debate to take place. Finally the Living in Love and Faith and Pastoral Advisory Group (GS Misc 1200) reported back on their work. Much enjoyed the later start to the day, heading to the train station for a lunch time train is better than my normal 07:22 to work! No problem with the trains or underground - did my flat in central Coventry to Church house in about 2 hours door to door. 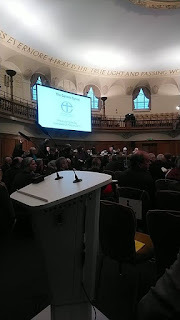 Always nice to meet synodical friends again - it's a bit like when you went back to university after the holidays. After the normal opening worship and welcome the first items of business was the business committee's report. Then a motion was moved for meeting dates in the next quinquennium. There followed a quite frankly tedious debate about whether meeting a weekends was a good idea or not with amendments to change the dates moved. Following on from this we heard from visiting Anglican Communion guests The Rt Rev'd Paul Korir, Bishop of Kapsabet in Kenya, and The Most Rev'd Dr Prem Chand Singh, Moderator of the Church of North India and Bishop of Jabalpur giving addresses on Evangelism and Discipleship. The contents of these addresses should be made available to read. The Archbishop of Canterbury had the tough act of following on with his presidential address. Then there were appointments of Clive Mather as Chair of the Church of England Pensions Board and Rev Charlotte Cook and Mr Joseph Diwakar as members of the Archbishops’ Council for a term ending on 22 February 2024 to be approved. Finally we moved on to Questions. I had somehow managed to get a written question at number 4 on the order paper! 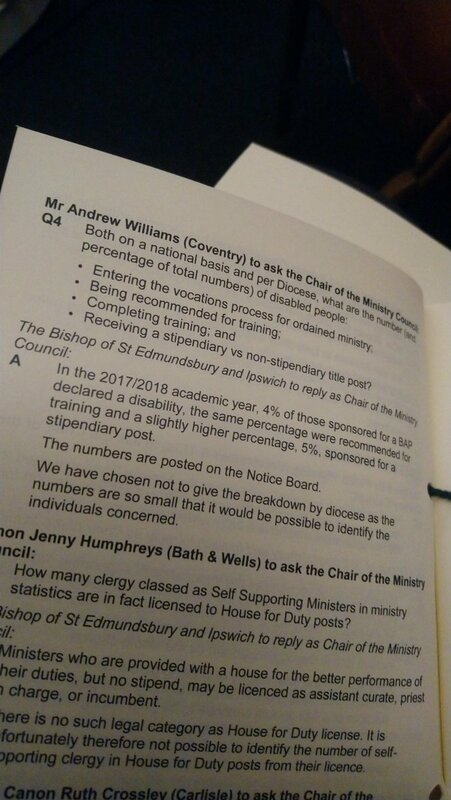 Bishop of St Edmundsbury and Ipswich as chair of the Ministry Council felt he could not give a breakdown by diocese as it might identify people, so I asked if he could do it over a 5 year sum total. He said he would look in to it and indicated that it might be useful as it might show variance between diocese - this is the information I am after. After staying and listening to more of question time I grabbed my bag and headed for my hotel where I am now typing this up.